Winner of ForeWord Magazine's 2007 Picture Book of the Year! Nominated for the 2009 Shining Willow by the Saskatchewan Young Readers' Choice Awards! Walking with her mother on the way home from school one day, Lily runs straight into a gruff and untidy-looking man selling papers on the street. 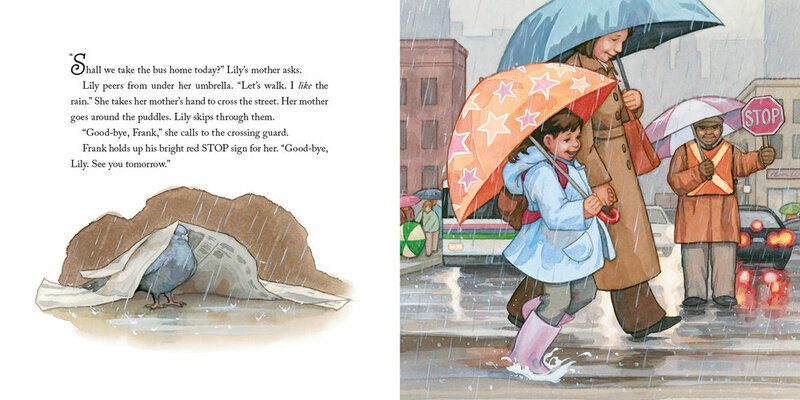 Lily is afraid of the man, but when the weather turns cold, she starts to see the Paper Man differently--she sees his bare toes through the holes in his boots and his thin shirt through the holes in his coat. As she lies in her cozy bed at night, she wonders how the Paper Man stays warm. Then Lily comes up with a wonderful idea - she'll make him a gift of warm clothes. Rebecca Upjohn has worked as an architectural photographer, sheep farmhand, bookstore helper, and more recently a writer and film producer for an independent short film for children called The Go Cart. Rebecca lives in Toronto with her husband, Don and their two sons, Harris and Emmett. The author of the picture books Lily and the Paper Man, The Secret of the Village Fool, and Patrick’s Wish, she is interested in characters who reach out to help others. She divides her time between New Hampshire and Ontario. Renné Benoit has been drawing pictures since she could hold a crayon. She now works out of her home studio in Southern Ontario. Her recent work includes When-I-was-a-little-girl by Rachna Gilmore and Goodbye to Griffith Street by Marilynn Reynolds, which was shortlisted for the Amelia Frances Howard-Gibbon award, and won the Christie Harris Illustrated Children’s Literature Prize in 2005.